7 – Pumping Shaft for Brayton Knowe Pit/ Baggrow Colliery.Structures numbered 1 to 15. 1: Corr. Iron shed used as hay store. 2: One stall wooden stable, felt roof. 3: Wooden oil store. 4: Wooden store. 5: Corr. iron Lamp house. 6: Wooden weigh house (3 tons max.). 7: Corr. iron office. 8:Corr iron smithy, 2 forges with hand worked bellows. 9: Wrought iron circular tank 54’’diam 18ft long, on brick base. 10: Brick chimney 10ft diam. 125ft high. 11: Boiler house, 2 Stirling boilers, 2 small horizontal pumps for boilers.. 12: Corr. iron winding house on brick base, with compound horizontal winding engine and 10ft cast iron winding drum. 13:Winding house with compound horizontal hauling engine and 6ft diameter rope drum. 14: Brick weigh house, slate roof, weigh bridge (max weight 20 tons). 15: Corr. iron pithead building, inc joiners shop, 3 revolving tiplers, steam worked riddle & coal chutes to wagons. Owner Francis Thompson, Brayton (for Sir W Lawson), occupier Allerdale Coal Co. Rent £1. Freehold. 212 – Station. No details. Colliery buildings now removed, one unnamed building (modern?) on the site, rest is rough grazing. Station building demolished. New dwellings constructed along line of railway. Fell View built post 1960. Bella Vista built post 1960. Wildways had been built by the 1960’s. The Sidings built post 1960. Station Cottage built between 1901 and 1925, when it appears on the 3rd Ed OS map. Station House built between 1901 and 1925, when it appears on the 3rd Ed OS map. 152 – Baggrow House. Contains:- Parlour, drawing room, breakfast room, Kitchen, back Kitchen, pantry. 1st floor. 5 Bedrooms, Bathroom. 2nd floor. 2 Bedrooms, 3 Box rooms. Coal house EC. Stone building cemented over, slated. nice garden at front & back. In the owner’s agent’s occupation and let at a low rental. Occupier James Thomson. Owner Sir W Lawson. Rent £15. Freehold. 158 – Baggrow. West House, contains:- Parlour. Kitchen Larder. 3 Bedrooms 5 stall stable lofted. garden washhouse & EC. Owner Jas Thomson, occupier Mr Husband. Rent £6.10.0. Freehold. 159 – Baggrow. West House. Cottage. contains:- Parlour. Kitchen 1 Bedrooms up. Washhouse & EC.garden. opposite station Cotts. Stone built slated only poor. Let @ – employee of owner. Owner Jas Thomson, occupier Edward Winter. Rent £5.17.0. Freehold. 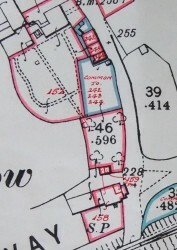 242 – Baggrow, Brow Top Cottage. Cottage contains:- Parlour. Kitchen Pantry Washhouse 2 Bedrooms common yard & coal house to 2 tenants Garden common to 3 tenants. Stone built slated only fair. Let @ 4/- per week & rates. Owners Js Thompson, Wm Noble & J R Thompson, occupier Wm Mitchell. Freehold. Sold (3 cottages) £325. 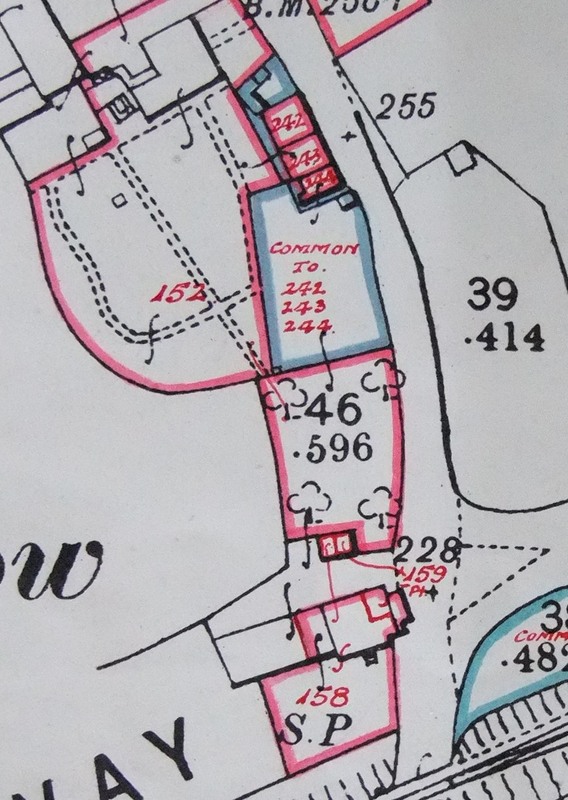 243 – Baggrow, Brow Top Cottage. Cottage contains:- Parlour. Kitchen Pantry 3 Bedrooms boxroom washhouse with ref no 244 garden common to 3 tenants. Stone built slated only fair. Let @ 3/5 per week & rates. Owners Js Thompson, Wm Noble & J R Thompson, occupier Wm Mitchell. Freehold. Sold (3 cottages) £325. West House and Cottage combined into one unit. Lefylde, new house opposite Brow Top Cottages, post 1960.